Durkheim followed one central question during his writings, namely the search for the “bonds which unite men one with another” (Durkheim, 1888: 257). Especially Durkheim’s early works are concerned in this respect with the forms of ‘solidarité’ that are specific for pre-industrial or lower societies in contrast to the ongoing industrialised or organised kind of community. In the ‘Division of Labour’, Durkheim arrives at a rather pessimistic account of modern, industrial society: although under ‘normal circumstances’ the division of labour leads to a harmonious society bound together by solidarity, our current form of industrial organisation is in an “appaling crisis” (ibd. : 339) composed of “organs that still clash discordantly together” (ibd. : 340). It is this account Durkheim gives of solidarity in the modern society that can be criticised substantially. The following essay will therefore consist of an analysis of his line of thought that leads him from early societies bound together by what he calls ‘mechanical solidarity’ based on similarities, to the notion of ‘organic solidarity’ in the ‘contractual society’. Especially his optimistic, evolutionary account of the development of solidarity, his use of empirical data and finally his idealised notion of society are possible points of doubt as will be shown. The concluding remarks will lift Durkheim’s analysis from the early 20th Century to a contemporary account trying to extend it with Foucault’s ‘penal society’. Durkheim develops his theory of the division of labour and its influence in the industrial society as a comparison between the modern forms of association with the lower, pre-industrial society. In this respect, he builds on earlier thinkers, especially Comte, Spencer and Tönnies, but simultaneously develops contrasting theses. For Durkheim, a different form of solidarity is responsible for the occurrence of social bonds in each societal form respectively. Before it is possible to assess his negative notion of the industrial society, it is therefore essential to understand the concepts of ‘mechanical’ and ‘organic’ solidarity respectively. The following paragraph will provide a brief overview of Durkheim’s line of thought concerning the development of ‘organic solidarity’. Lower societies, such as Waitz’ ‘Naturvölker’ but also Romans or early Jews, are bound together by “mechanical” solidarity (Durkheim, 1984: 61,84), a “solidarity sui generis which, deriving from resemblances, binds the individual directly to society” (ibd. : 61). This solidarity finds its equivalent in every member of the respective society in a strong “collective or common consciousness” (ibd. : 39), which is in turn made up of “the totality of beliefs and sentiments common to the average members of a society” (ibd. : 38). This ‘conscience collective ou communé’ is the source of cohesion in the pre-modern society: when the collective sentiments, the collective history is strong, the solidarity based on similarity is at its maximum – people are bound directly to society. In this instance, the individual consciousness is not developed - “individuality is zero” (ibd. : 84). Every member in society shares the same set of beliefs. When society in its organisational forms is organised differently, however, the form of solidarity is as well. As Durkheim (ibd. : 85) argues, “each one of us depends more intimately upon society the more labour is divided up.” Society is held together by interdependencies and professional groups replace the former segmentary organisation. With a growing division of labour, society becomes a “system of different organs […] co-ordinated and subordinated to one another” (ibd. : 132). Exchange becomes the normal form of interaction and with it the contract as “the symbol of exchange” (ibd. : 80; 150). The division of labour produces a ‘contractual society’ where the bond between the units is the strong, direct bond and the bond between each individual and society is indirect (ibd. : 83ff; Alpert, 1961: 182). In the same way as the individual becomes more specialised, the ‘conscience collective’ becomes weaker (Durkheim, 1984: 106, 117): “the individual […] feels […] much less acted upon; he becomes more a source of spontaneous activity” (ibd. 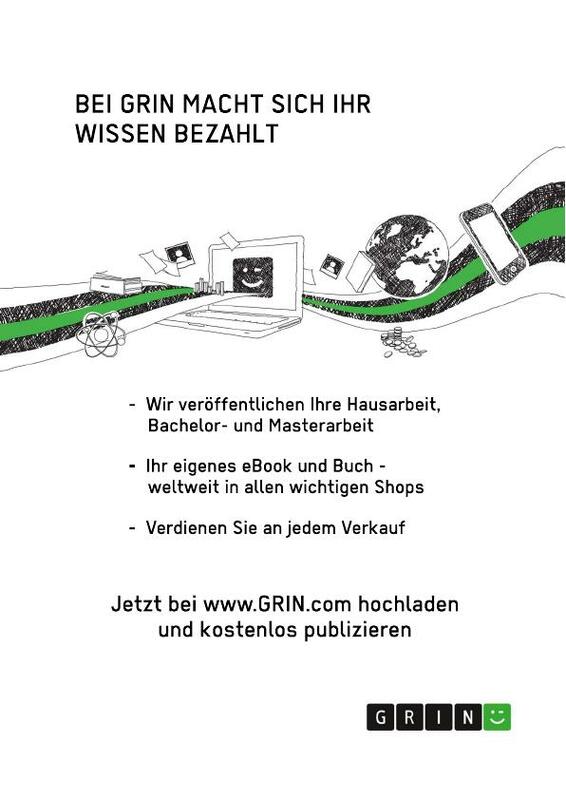 : 120). In effect, “social solidarity is tending to become exclusively organic” (ibd. : 123, 85), solely a result of the strong interdependencies resulting from the division of labour. Nevertheless, both kinds of solidarity co-exist – even in industrial societies, the conscience collective is still part of each individual and with it also mechanical solidarity – organic solidarity and the individual consciousness are more substantial, however. Summing up Durkheim’s argument, one might conclude, that although deeply routed in their specific kind of society, both kinds of solidarity lead to a harmonious interplay. According to Durkheim (ibd. : 330), “they both correspond to the same social need and satisfy it only in different ways […] they lead to the same aim, but by opposing routes.” His attitude towards the industrial society and its form of solidarity seems to be rather positive: the division of labour is not per se a negative development – to the contrary. It merely produces a different, but even stronger kind of solidarity between the members in society that Durkheim calls ‘organic’. 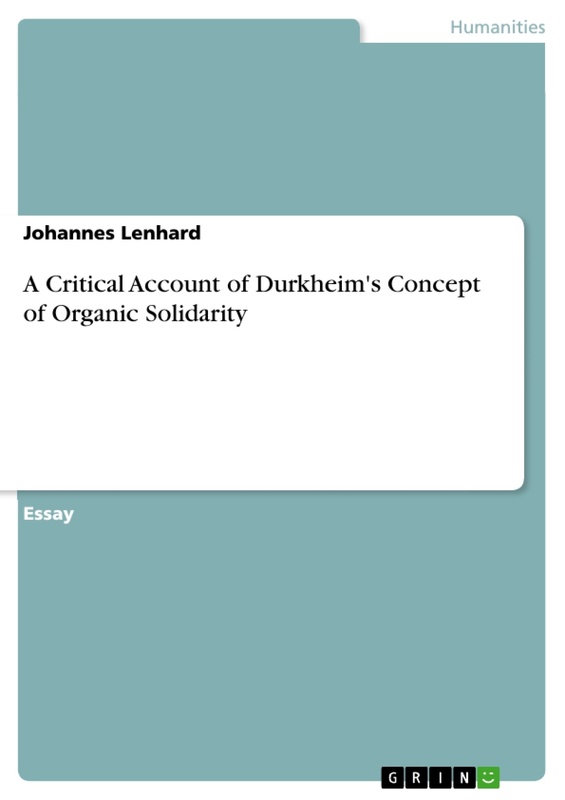 It is already at this point, where one might ask: why is Durkheim’s theoretical account of organic solidarity as positive as it is? Without taking into account what he calls the ‘abnormal forms’ of the division of labour that will be dealt with below and that lead to the negative notion mentioned above, it seems rather questionable to assume the development Durkheim depicts. This paper will focus on two reasons in the following paragraph, namely on the one hand possible negative effects of interdependencies within ‘organic solidarity’ and on the other Durkheim’s method. Firstly, Durkheim is not concerned about the negative effects of the dependencies created by the division of labour. For him, these mutual interdependences produce solidarity, which is the ‘glue’ for society, societies’ moral. One might object, however, that there is also a negative side. Considering this further, it is possible to argue that for example in terms of the purchase of everyday products, such as food or clothes, the division of labour has led to complications. Families in primitive societies were self-supporters – completely independent from other producers. In the modern age on the other hand, one is not able to live without ‘depending’ on the products of others. One has to be in contact, in exchange, in contract with other parties – whether welcome or not. There is no choice between independence and dependence in this sense. Although man is liberated (Durkheim, 1984: 119; Durkheim, 1924: 106), he is at the same time caught in a net of interdependencies, a net of binding contracts, in the modern age. It is obviously necessary to see that on the other hand the division of labour has brought variety. Variety for example in terms of the everyday products mentioned above, but also cultural variety, the possibility – and necessity – to travel, access to information worldwide – choices that men is used to nowadays, but that are actually a product of the industrial society and the division of labour. In this vein, Durkheim already saw the approach of a ‘world society’ (Durkheim, 1984: 337ff), what might now be called ‘globalisation’. Exchange when thought in this way as a result of the division of labour has led to the interconnected world that for the modern man is a world of choice. Thinking ahead with Durkheim, thus leads to an ambiguous view: on the one hand choice is reduced by the division of labour due to dependencies, but on the other hand the same necessity of exchange produces a huge variety of additional possibilities. The above critique should however make clear, that Durkheim’s view might need to be carefully examined at certain points. Secondly, the method Durkheim uses to come to his conclusion is worth further comment. Durkheim’s main argument rests on the empirical examination of the codes of law that are representative for each form of solidarity respectively. Alpert (1961: 179) and also Lukes and Scull (Lukes/Scull; 1983: 33ff) describe this method as “objective indexes”: when the index, in this instance ‘law’, is defined, one “only has to ask what are the bonds of social solidarity corresponding to each of these two categories of laws” (ibd. : 179). According to Durkheim, penal or repressive law is associated with mechanical solidarity (Durkheim, 1984: 36, 61, 92), whereas restitutory law is linked to organic solidarity (ibd. : 68ff). He employs concepts such as ‘crime’ and ‘punishment’ to be able to empirically track which solidarity is dominant in what kind of society. His argument that organic solidarity is prevailing in the industrial society then rests on the empirical analysis of the codes of law: comparing Roman, Hebrew and modern laws, Durkheim argues that in pre-modern societies, law is substantially repressive whereas modern law is based on restitutory sanctions (ibd. : 69, 92ff). Since penal law is linked to mechanical solidarity and restitutory law to organic solidarity, mechanical solidarity is dominant in the pre-modern society and organic solidarity in industrial society. This whole line of argument, of links between law, society and solidarity is in no way justified: although he is initially resilient of comparing the number of rules for each type respectively (ibd. : 108), he finally argues that “a large number of criminological types have gradually disappeared” (ibd. : 109), “without any compensating factor, for no varieties that are absolutely new have arisen” (ibd. : 115). What he does in this instance seems like a simple mathematical calculation in order to shed light on the abstract determination of the dominant form of solidarity. One might furthermore in a brief comment note that Durkheim potentially misinterpreted his empirical findings in terms of the importance of penal and restitutory law in pre-modern and industrial societies. Especially his account of the pre-modern society can be criticised: for example followed his nephew Marcel Mauss (1950/2002) Durkheim’s sociological ideas and examined the indigenous people in Polynesia. He found in contrast to Durkheim that they were much dominated by a high degree of reciprocity rather than penal institutions. As Lukes (1985: 159) puts it: “Durkheim vastly understated the degree of interdependence […] in pre-industrial societies, constituted by ties of kinship, ritual participation and political alliance.” Arguably, pre-modern societies are therefore influenced more by interdependence in the same way as they are to a lower degree associated with repressive law. These examples should only make clear, that the reader needs to be careful following Durkheim’s empirical arguments. They might be a methodological ‘trick’ on the one hand or partly uninformed on the other. Secondly, Durkheim depicts three ‘abnormal types’ (ibd. : 289) of the division of labour: He states, that “like all social facts, and more generally, like all biological ones, it manifests pathological forms” (ibd. : 291). It is these pathological forms that lead to the illness of industrial societies. Belief might here be understood not only in the general, but also indeed in the religious sense. The content of the conscience collective in pre-modern societies is often defined by religion (ibd. : 130). It should be noted that Durkheim (1912/2001) dedicated a whole work – ‘The Elementary Forms of Religious Life’ – to analyse the role religion plays in the conscience collective. Within this analysis, no further emphasize will be placed upon the content of the common sentiments, however. Durkheim understands division of labour not only in the industrial or commercial sense of the word. For him, also in the family as well as in other segments of everyday life (e.g. administration) an increasing division of labour takes place (ibd. : 78ff). It can thus be seen as a universal phenomenon. 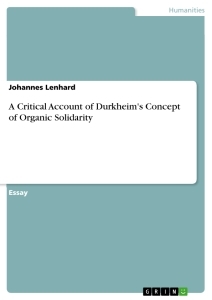 It is not the aim of this paper to evaluate the account Durkheim gives of these concepts although they are important also for his thoughts on solidarity as is shown.  See Alpert (1961: 179ff), Lukes/Scull (1983) or Durkheim (1900) for a more detailed view. The argument was simplified here to a certain extent since it does not seem to be central to Durkheim’s account of organic solidarity. The analysis given should however be sufficient in order to acknowledge the possibility of critique. Since Lukes (1985) gives a good account of this critique on Durkheim’s empirical argument, this should be understood as a mere side note here. For Durkheim, the decline of mechanical solidarity in modern societies is deeply worrying. Provide a critical assessment of Durkheim’s account of organic solidarity in a “contractual” society.